Jimmy's Wedding — Comments Off on Jimmy and Jiao Jiao toast me at the wedding. Jimmy and Jiao Jiao toast me at the wedding. Click this link for Mongolian toast. Jimmy's Wedding — Comments Off on Pictures have been added for days 1 and 2 of the trip. See the pages by day to the right. Pictures have been added for days 1 and 2 of the trip. See the pages by day to the right. Cary asked me to read through her posts and add what is missing and any other comments. The wedding was a two part process, the events at the home where Jimmy claimed Jiao Jiao and the ceremony at the hotel. The ceremony at the hotel was in three parts. First a blended western/Han wedding, next the real deal, a Mongolian wedding with Mongolian entertainment and lastly some sort of event where Jiao JIao changed into several different dresses. A videographer filmed everything and hopefully we will have something to share from this in a month or so. They seemed like real pros, but I have no way of knowing that. The wedding events, started with our entourage driving to Jiao Jiao’s parents home in a line of 10 or so Audis and a big stretch limo. At the home, Jimmy gains entry by giving the brother and friends small cash bribes. Next, as we all enter the house, Jimmy tries to gain entry to Jiao Jiao’s parents room where Jiao Jiao is sequestered with her bridesmaids. The bridesmaids asked questions about Jiao Jiao that he has to answer. All of this was in Mandarian and I don’t have a clue what the questions were. Next we all enter the room (very packed) and there is more dialog between Jimmy and the bridesmaids and then dialog between Jiao Jiao and Jimmy. She has her body turned away from Jimmy this whole time and is stunningly beautiful in her white dress. JImmy missed the queue from the interpreter as to the shoe location so he fumbled a bit, but found the shoe and put in on her foot. Cary and I then left the bedroom, while Jimmy, JIao JIao and the bridesmaids stayed in the bedroom. Cary and I then sat next to Jiao JIao’s parents in the living room and there was some other part of the ceremony without JImmy or Jiao Jiao that I forget. Then, Jimmy carries Jiao Jiao into the living room. We don’t have a shot on our camera, but hopefully someone else does. They both looked so happy. There is then a ritual in Mandarian where JImmy accepts the Bai’s has his parents and calls them mother and father in Mandarin. Jiao JIao then does the same with us and call me Dad and Cary Mom in English. 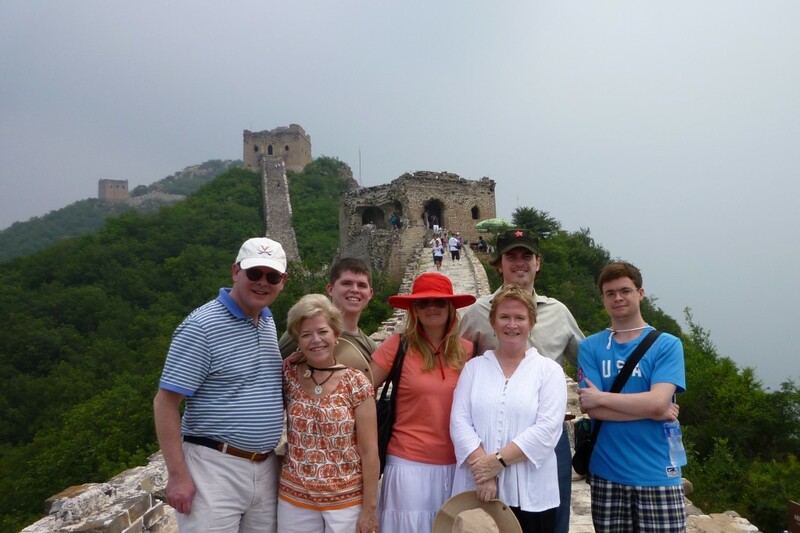 The Chinese don’t seem to have the concept of in-laws, we are one extended family now. 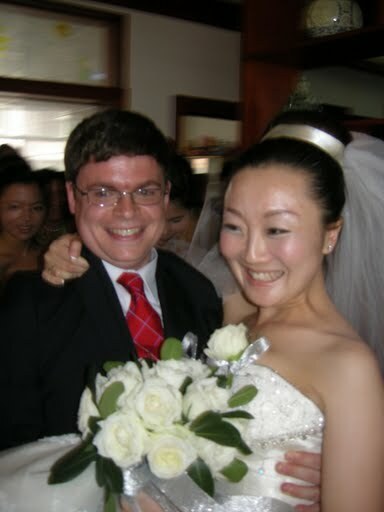 My recollection is that somewhere during the house ceremony, Jiao Jiao and Jimmy are now considered man and wife. I forgot to add that the wedding is run by an MC/DJ type and he is part of the this apartment event. The MC man is also the wedding planner’s husband. The ceremony at the hotel begins with the bridesmaids and groomsmen gathered behind an arch of roses and then to the tune of music I forget, marched towards the center of the stage in a traditional western style. Tom Leary led the way with the lead bridesmaid, a/k/a the hot one. All the bridesmaids were Cantonese and spoke little Mandarin and no English. This is the beginning of the Western/Han phase of the ceremony. A few comments on the western part. JImmy and Jiao Jiao pour rice wine or some other booze in a cup type champagne glass looking set up that cascades down to lower glasses and into a bowl in the bottom. When each glass is half full, a blue light goes on in each glass. There is dry ice or something in the bowl to send of a white fog when the bowl is full. From here on in most of my recollection is a blur. 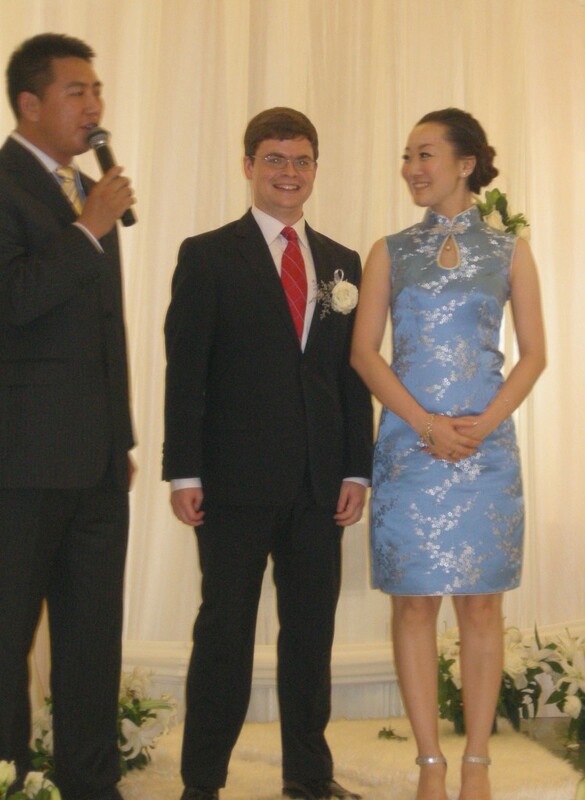 Our interpreter didn’t realize I was the father of the groom until half way through the event because I looked so young! She was soft spoken as was Antonio our guide who also interpreted in a mike for all to hear. The DJ and music was so loud I couldn’t here any of the conversation or interpreters. In addition, the local food had caught up with me big time and I was simply trying to avoid passing out. Somewhere in all of this, but I think it was in the first part of the wedding, John, Jimmy’s boss at USITO made a long speech and toast including a reading from the bible. Local tradition is that a wise man make such a speech and since Jimmy’s boss has a PhD (Math from Hopkins) he was chosen and introduced as the Professor. Next there was a pause in the ceremonies for a while, as Jimmy and Jiao Jiao changed into traditional Mongolian garb. The videographer went around the room taping toasts to Jimmy and Jiao Jiao from people at all the tables. There were 30 to 40 tables of 10 each. Typical of the Chinese, there was a lazy suzan in the center of the table. At the start of the event it was full of sodas, chinese munchies and a plate of cigarettes. Later the food was added, but because of our sorry states we ate little. At the end, the guests came to our table and carted everything away in goodie bags. Jimmy and Jiao JIao then dressed in beautiful Mongolian garments they had made for this event and then entered a private room for a blessing of sorts from the Party Chairman. At that point, if memory is correct (50/50 odds) the Mongolian part was then led by a Mongolian guy in Mongolian clothes. Somewhere in this part, Cary and I were welcomed to Mongolia, given rice wine (the local grain alchol that also stabalized my stomach for a few hours) and given traditional white welcoming robes, similar to what happend at the yurts out on the grass lands a day or two earlier. The end of the Mongolian phase were solo performances by a Mongolian string player, a throat singer and a female vocalist. The string man played a cello sort of looking instrument with an approximate frequency range of a viola. The music was raucous, similar in style to the electronic violin riffs in Dave Matthews’ music. The string man got the crowd going (and drinking more) and he was followed by the throat singer. Throat singing can only be heard and not described. But he started with long very low tones, then to higher and higher tones of shorter duration. The throat singer ended by singing all the tones simultaneously. Peter and I have both search google for Mongolian throat singing and this performance simply blew away all such performances that are readily available on the web. The female singer was more quiet in nature than the two prior artists. Hopefully, the video will have all this music, it was miked and taped I think. Next anyone who wanted to could get up and sing. Lots of local did singing chinese pop songs. Lots of fun. Phase 3 of the wedding is when Jiao Jiao enters the room several times in different dresses. She was stunning beautiful in all. I have no idea what this last phase was about. The event was capped by 45 minutes to an hour of spontaneous photo taking of just about all permutations of the people and groups in the room. Cary and I then returned to our rooms and slept for several hours. The younger members of our entourage went to the hotel lobby where they were toasted many times by the local party officials and by members of Jiao Jiao’s family. Jiao Jiao’s Dad, I am told, laid off the toasts, has he had a bottoms up rice wine toast with each of the 35 to 40 tables at the wedding. As a side note, rice wine is always drunk bottoms up and is not something to sip, more or less Mongolian shot drinking. The physically lightest in our entourage was out for the count from the lobby phase of this event and stayed in Tom Leary’s room until about 4:30 AM. Around 7:30 or so in the evening, our entourage regrouped and Jimmy treated us (less the one) and the Cantonese members of the wedding party to dinner. I picked at the food because of my stomach, but it all looked good. Fortunately, the weather cooled and it poured rain. The room where we dined had windows that opened so we had cool fresh our for the first time that felt good.